I wrestle chaos - Laughs! Thrills! Pathos! One of the ways in which the blogging world continues to inspire me is to make me want to create things of beauty. To name but a few, Ryan Marshall takes wonderful photographs*; Holly Burns does lovely art and craft things in her house and has been the force behind inspiring me to actually make my bed every day, because it looks nicer and makes me feel a million times better. chiller and mockduck make me want to pick up pencils and pens and draw and design something already. Antonia reawakens my own sense of playfulness and causes me to draw bad cartoons**. I look at the beautiful things that people I know and people I don't create and I feel moved. Inspired into being a little bit greater than the routines of my daily life and think all kinds of pastel Ophraesque thoughts about beauty and meaningfulness. That I want to expend the energy and make time and create things which please me - whether they be drawings or photographs or neat bedrooms, so that when I have a break in my day I can look at them and feel good. sorting out the messes they generate on a daily, even hourly basis, takes a lot more energy than I think I have. So I end up feeling downhearted. And then I look at the mountains of dishes and the tyranny of unfolded laundry and the hostile invasion of the post and I feel paralysed beneath the relentless dullness of it all. But then one of you lot does something marvellous. And it makes me go Oooh and shine a little bit. It makes me wish to look around and clear surfaces and create beautiful things. To invest effort into it, even though it is boring and repetitive and risks leading Z to believe that there are fairies which swoop down and put away the socks he so kindly leaves for them on the floor. It makes me want to do my best even though (barely) controlled chaos is the most I can aspire to. * Steve McCurry also takes wonderful photographs. But I'm not going to be able to replicate his Travelling-With-Enormous-Lenses lifestyle anytime soon, so I have no aspirations. Although Romany might. **Not that Antonia herself draws cartoons badly. 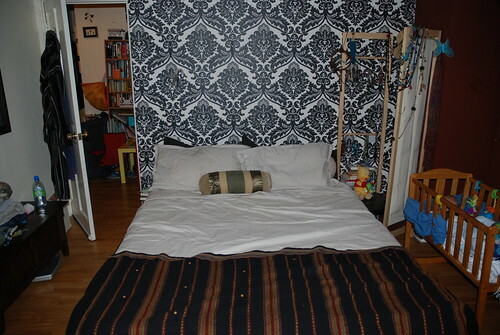 I love the Klimt canvas, even though I appear to be assaulting it with laundry. I love it love it love it, and it brings me joy daily. I finally learned that children don't care if the house is spotless, or meals are exquisite three-course affairs, but they do remember time spent with them, how you play with them. So give yourself a big old break in that department. I take out art books from the library, then thumb through them at night or when I need a lift. It's hard to make time for sensuality, beauty, anything in your body when you're just getting through the days. But I can tell you that even a few minutes does wonders. It's a weird circle in which excessive cleaning makes me depressed, as does looking at mess. On the other hand, M is quite into cleaning so I get to fulfill my dream of gainfully employing him to scrub the floors. And then I feed him some weak gruel. I do think that all your beautifully-crafted posts are works of art in themselves. 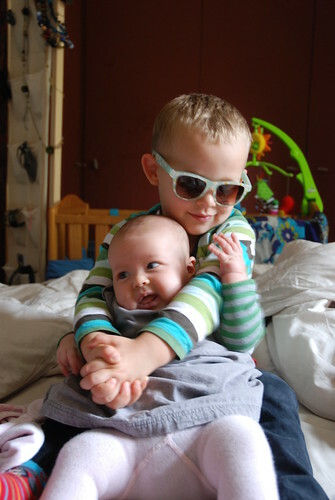 And if that's what you can do in the chaos of early motherhood...! 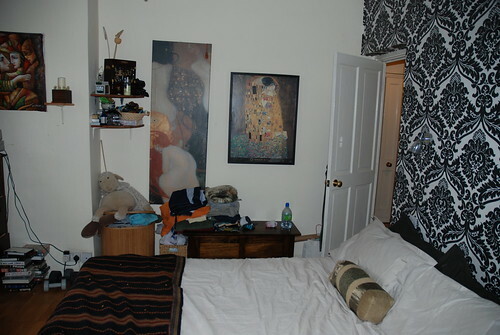 Gustav Klimt on the walls! Excellent!